The 62nd annual Anne McIntosh Ladies Bonspiel will be held January 19th, 2019. It will be made up of 12 teams from outside the Bobcaygeon Curling Club and 4 teams from the BCC. Teams will be drawn from entries on a first come basis by the closing date on the application. Anne McIntosh, one of Ontario’s and certainly Bobcaygeon’s outstanding women curlers, was a two-time winner of the Ontario Ladies Tankard. She was in her second term as president of the Ontario Ladies Curling Association at the time of her passing in 1956. The bonspiel is sponsored by Shawna George, owner of My Favourite Things. 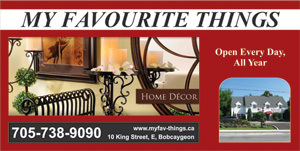 This store has quickly become THE place to go in Bobcaygeon and surrounding area for home decorating ideas. Shawna has offered to continue to support this bonspiel by generously contributing her talents, time, gifts and prizes. This one-day, two-draw event starts with coffee and goodies to get you ready for competition. Then, after lunch, there is an extended period of time in which curlers may visit My Favourite Things. Finally, after your second game, the day wraps up with a catered dinner where all the curlers from both draws have the chance to visit before our winners are announced. We welcome all team applications. We look forward to meeting you.